Leasing Available from $64.89 per month! 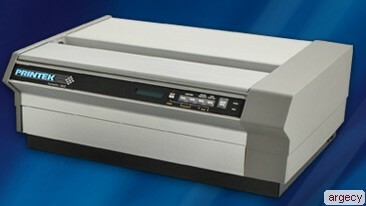 The FormsPro 4600 Series printers can solve your toughest printing problems and automate most paper-handling functions. With the FormsPro Series, you'll print with greater legibility and unsurpassed reliability. A draft speed up to 530 cps, which prints a typical 1,000-character document in less than five seconds. That's over 700 documents per hour! Auto-switching power supply can work domestically and internationally, and it weighs less! FP4600 has single set of tractors while the FP4603 has our patented Tri-Trak system that allows for three different set of tractors to be loaded! Superior legibility- even on 9-part forms. Auto-Gap feature adjusts the printhead according to form thickness. Easy-load, tilt-up top to simplify loading, and straight-up paper path eliminates the problem of forms buckling and jamming. A paper jam sensor to permit reliable, unattended operation. Optical sensor prevents printhead from printing beyond the edges of the loaded form. Ability to print 9-part forms. FormsPro printers have 30% higher impact force than other brands, making them the preferred choice for situations where thick forms and multi-part legibility are an issue. The increased readability helps to increase the accuracy and efficiency of your staff in accounting and operations. Certain Printek models (FormsPro 4603) have our patented Tri-Trak system. This is the only paper-feeding system on the market that allows three different continuous forms to be loaded into one printer. This feature saves a great deal of unproductive time spent loading and unloading forms and also saves space and computer ports.